As soon as we in my community sense the danger of frost has passed, we don gloves, grab tools, and take to our yards. Some plant gardens; others plant shrubs and flowers. My house falls into the flower camp. Recently, I labored over the planting of Snapdragons, Periwinkle, Geraniums, Dianthus, Begonia, Petunia, Hibiscus, and Mandevilla. Mom says I have a “green thumb.” Plants seem to like me — and generally do well once I’ve placed them in soil or pots. But the morning after my planting spree, I went outside to check on “the babies,” and what did I see but freshly dug holes in the soil! And what did I smell but the distinctive scent stench of cat urine! Now, my neighbor has cats — several of them — and they roam free, terrorizing baby bunnies and birds, while professing a fondness for my flower pots as their personal toilet. Totally unacceptable, I’m telling you! So I took to Twitter to find out how to repel them without hurting them. And one of my friends was kind enough to link me to a site showing that cats don’t like the smell of citrus. Well, I busted out a fresh orange for lunch, ate the “meat,” chopped up the leftover peeling into small bits, and applied the pieces liberally to the surface of my pots. Thus far, the citrus seems to be working. Despite my intense scrutiny, I’ve not found any more freshly-dug holes in my flowers’ soil, and the odor of cat urine has dissipated. Still, I’m reserving judgment until I know for sure. Because maybe it’s not cats after all, you know. I’ve tried to be kind. Patient, even. But I’m not taking this lying down — I didn’t do all that work so interlopers could come along and make a mess of things. My next option is to spend the night on the front porch with a water gun, ha! 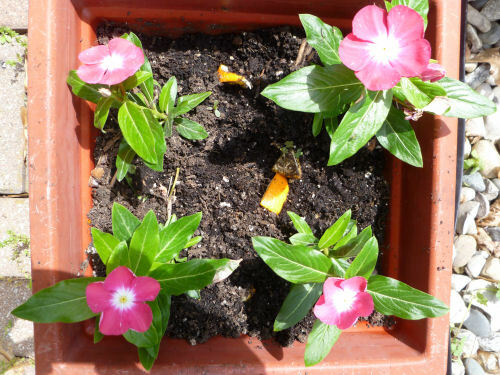 This entry was posted in Seasonal and tagged cats digging in plants, flower planting, how to keep cats out of plants, repeling cats from plants. Bookmark the permalink. I’ve been told that if you chop up the citrus peel in a food processor or blender, it increases the amont of oil that’s released, as well as producing smaller bits that can be sprinkled over a larger area. Thus endeth my garden tip for the day! Well, except to add that squirrels can’t abide cayenne pepper, so if you catch a squirrel wreaking havoc, a sprinkling of that might help. Really? I’ll have to give that a try. These orange chunks are getting kind of moldy-looking, and, while I don’t want the kitties to become sick over them, I don’t want them to ruin my plants either. Thanks for the tip, Linda! And I’ll have to sprinkle some of that cayenne pepper, too — just in case squirrels are the guilty culprits! Tommy & Tuppence are devastated and plotting revenge! Though they’re pleased you’ve gone for a non-lethal variety of cat deterrent – some of the stuff that’s available these days could find a place in a torture chamber. My cats don’t use the neighbours’ gardens as far as I know, but Tommy does have an endearing little habit of liking to piddle on the fenders of their cars. Shhh! Don’t tell them! I’m sure Tommy & Tuppence would never mess with my flowers, FF! They’re well-behaved kitties, not like the brutes that live next door. Although, now I’m wondering. Do cats kill snakes — for sport, I mean? I found a gutted garter snake on my driveway this morning, and I know I didn’t slay it. Nor did Dallas. Perhaps I should be encouraging kitty presence, in that case, HaHa!! Yikes!! Dallas doesn’t even seem to see snakes (perhaps they have no odor??). But he’d be all for joining “the fun” if he heard me shriek at one and reach for the hoe, ha! Good thing you don’t have the beasts. I can’t imagine waking up and finding one — even a dead one — in my bed!! We confined our cats to indoors when they were kittens. Our area has a number of Coyotes who love kitty munchies. I think the blender citrus is a great idea. Yikes, coyotes?? I understand some have been seen in my area, John, but I’ve never seen one. I have no clue what Dallas would do if he encountered one — though it’s my guess he’d try to herd it into a corner and play with it, Ha! he would want to get away I’m thinking. LOLLLLLLLLLLL, so glad you are kind to the kitties. ORANGE slices! I shall tell my neighbor about this ( and supply them for her ) she does not care for my Tom Cat, Bizzy! This is good to know! We have several roaming cats in our neighborhood…totally sends my cat (indoor only) in an uproar when cats appear in our yard as she watches from the window. Once one got up on the outside window ledge and my cat tried to attack it through the glass, ha! she seriously does not like their invasion on her territory even though she isn’t allowed outside. Dallas doesn’t like “critters” in his yard either — except for garter snakes, which he doesn’t seem to notice at all! Keeping a cat indoors seems like the kindest solution, both for the kitty’s own safety and for maintaining peace with the neighbors, Suzi!! Debbie, what a GREAT tip! I had no idea cats did care for the smell of orange slices. If I’d known that back when I had two cats, I would have applied it to certain areas that I didn’t want them to go (like using my couch for a scratching post) instead of using a water pistol – HA! OMG, that made me laugh out loud because I’m the same way. My rising is VIRGO so I have a lot of Virgo traits. And btw, those flowers look GORGEOUS! Hope you had a super weekend, my friend! Ron, I’m thinking lemons, limes, or tangerines might work just as well as oranges, since they’re all citrus. I was surprised, too, to learn that. I wonder if orange- or lemon-scented furniture polish would do just as well indoors?? Weekend was pretty much a wash-out here — nothing but rain on the horizon for the coming week, either. Sigh. Hope your week is beautiful!! Don’t try to deny using a ruler. It’s ok. We understand. Did you ever sing the song the Cat Came Back when you were a kid? http://www.scoutorama.com/song/song_display.cfm?song_id=618. No worries, I am betting on you! You’ll get the last meow! The lyrics to that song look familiar. I don’t remember singing it, but I’ll bet Domer did, either in preschool or one of those early grades. Thanks for the memories! I promise, I did NOT use a ruler — a more finicky Virgo would have! Ah, the last meow — great way of expressing it, and I’m hoping you’re right!! A night on the front porch with a water gun sounds like fun. I’ll come over. We’ll catch them, Debbie. Pretty flowers! Ooh, you’re volunteering to help? Woo-Hoo, I can’t miss now! Thank you, Audrey. You Texas gals are sure-shots when it comes to “weapons,” so we’ll whip out some of those super-soakers and have a party!! Absolutely! And perhaps a tall cool drink with an umbrella in it?!? Actually, not quite. In these parts, cats disappear left and right. That’s because coyotes eat the cats. I don’t think Dallas is up for that. He’s not fond of cats, but I can’t imagine him eating one!! Sad that folks don’t keep their kitties inside when coyotes are on the prowl. :) Good luck trying to outwit those sly kitties, Debbie. Here in Sicily I have a problem with pigeons and I’m always trying new methods to outsmart them. It’s a constant poo-ey battle. Bless your heart, Jann, for empathizing! I do think the citrus is having a positive effect, though. Or maybe they just don’t want to venture far from home these days, ha! Have you tried Googling “pigeon removal”? I understand they don’t like spices, so perhaps a bit of cinnamon or pepper might be a deterrent?! I love cats, but not destructive ones (mine are indoor only.) Their urine is bio-weapon nasty. Nothing quite like it. I hope the citrus worked… but it is kind of fun squirting them with water when they are naughty. Yes, I have an evil streak!